In my last post I talked about "awards division" watches and how they often were slightly modified versions of obsolete models. This time I have another example to show you. In 1959 Hamilton introduced the Chadwick, part of the Medallion line. It's easily identified by the unique shape of the delicate lugs. It was produced for four years. 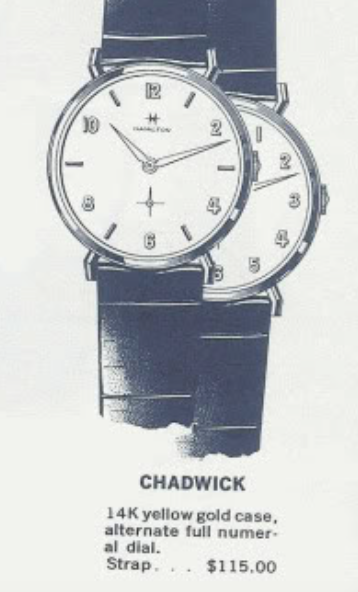 In 1960 an alternative all-numerals dial was also offered. The Medallion line offered the 770 movement and solid gold cases. It harkened back to the days when the solid gold models got the 982M movement... the M was for medallion. The 770 was in other lines too though too. 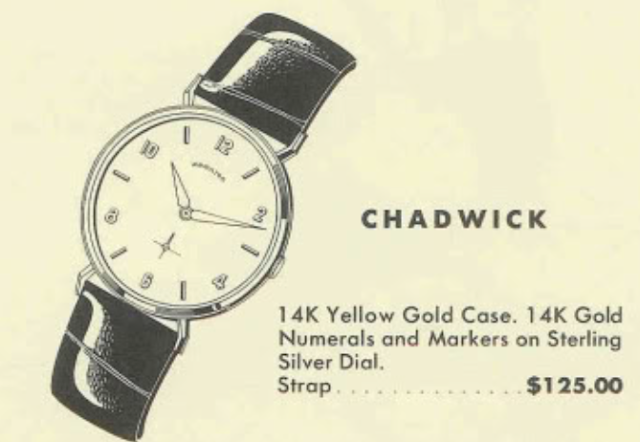 The Chadwick had a sterling silver dial and solid 14K numerals and markers. I recently landed a Chadwick but it's an awards watch so it's dial is a slight variation, it has two different styles of markers in addition to numerals at 12 and 6. But you can tell it's a Chadwick case from the shape of the lugs. Notice also that it says "Masterpiece" on the dial - a sure sign that it's an awards watch. This one is in pretty good shape, just the crystal is a little beat up, otherwise it's very nice. This watch was a service award for 25 years of service to GM in 1965. The Chadwick is a front-loader, as you can tell from the female portion of the two-piece stem in the movement. The case has a very long stem tube to reach into the 12/0 size movement. There's also a metal movement ring inside to support the squarish movement inside the round case. Everything is thoroughly cleaned and dried. I like working on the shock jeweled Hamiltons. Its very easy to clean the balance jewels because all you have to do is squeeze the sides of the shock springs to release the jewels. The now-running movement is off to the timer. Rats... it's running with brisk amplitude but the beat error is a little too high. 3.0ms is usually my threshold. It's a pain to adjust it but I've made it this far... might as well go the distance. Adjusting the beat error often means guessing which way to move the hairspring collet. You have a 50% chance of being right. As the old knight in "Indiana Jones, the Last Crusade" said, "I chose wisely", and reduced the error to a respectable 1.3ms. Notice how more closely the two lines are now. The closer to zero the beat error, the closer the lines get to each other. Ideally they should be right on top of each other. A new crystal will make this 1965 model look like a 2016 model. A fresh teju lizard strap completes the restoration. This turned out to be a beautiful watch! Great post! I picked up one of these a year ago but couldn't identify it. The one I bought lacks the movement holder, so it wiggles in the case. I installed a tension ring crystal, and amazingly it did the trick. This a gorgeous piece and amazing restoration. I know this post is from 2/2016, but is there any chance you still have it and would be willing to sell? I'm afraid not but it did turn out nice, for sure.